Wednesday 13 March 2019 - Sailing Cancellations. Most Sailings - Due to adverse weather all services to the Channel Islands, Isle of Man and the Scottish Islands are cancelled today and tomorrow. Unfortunately there will be major delays with all deliveries this week, the backlog will last into next week. Wednesday 02 January 2019 - Happy New Year. 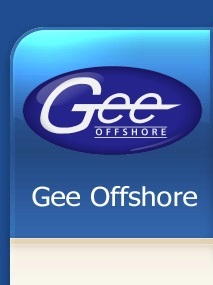 Best wishes for a happy and prosperous New Year from all of us at Gee Offshore. Tuesday 17 July 2018 - Ferry Delay. Unfortunately there will be delays with non-perishable deliveries. We will endeavour to deliver goods as soon as possible. Monday 25 June 2018 - Ferry Maintenance. Channel Islands - The Commodore Clipper and Commodore Goodwill both require maintenance in dry dock. The Goodwill was removed from service on 25 June, she is scheduled to return to service on 9 July. The Clipper will be removed from service on 9 July, she is scheduled to return to service on 23 July. During this period the MV Arrow will operate the replacement service. There is a requirement to cancel the evening call into Guernsey every Wednesday which will continue until the Clipper returns. Unfortunately, due to the lower trailer capacity and sailing profile of the MV Arrow there will be disruption to deliveries. We will keep you informed of specific disruptions as they occur. Friday 25 May 2018 - Isle of Man TT. Isle of Man - 26 May to 8 June is the Isle of Man TT. This is an annual motorcycle event run on the Isle of Man and as there are road closures, delays to deliveries are to be expected, especially as Friday 8 June is a Bank Holiday. Monday 30 April 2018 - Liberation Day. Channel Islands - Wednesday 9 May is Liberation Day. This is a national holiday for Jersey and Guernsey and no deliveries will be made. There will be a knock-on effect especially following the Bank Holiday on Monday 7 May, and some of the week's deliveries will be delayed. Monday 30 April 2018 - Sailing Cancellation. Channel Islands - Yesterday evening&apos;s sailing was cancelled due to a radar system failure on the Commodore Goodwill. Engineers were unable to rectify the fault immediately and was necessary to cancel the service. We will keep you informed of any further sailing cancellations. Friday 02 March 2018 - Sailing Delays. Channel Islands - The Goodwill has sailed to Jersey first, arriving at 08.05 - Guernsey ETA is 12.00 noon, 9 hours behind normal schedule. Unfortunately there will be delays with deliveries into the early part of next week as the backlog is cleared. Wednesday 28 February 2018 - Sailing Cancellations. Wed 28 - Goodwill morning arrival at Guernsey is cancelled. Wed 28 - Clipper evening arrival at Guernsey is cancelled. Thu 01 - All sailings to Jersey and Guernsey are cancelled. Fri 02 - The next scheduled arrival for Guernsey will be Friday morning, weather permitting. Unfortunately there will be major delays with Guernsey deliveries this week, the backlog may last into the early part of next week. Monday 26 February 2018 - Sailing Delays. Guernsey - Due to high easterly winds it was not possible for the Goodwill to safely berth in Guernsey this morning. The weather this week is expected to deteriorate further with severe easterly winds. Unfortunately this is likely to result in disruption to the schedules of both the Goodwill and Clipper. We will keep you informed of specific disruptions as they occur. Tuesday 13 February 2018 - Sailing Delay. Guernsey - Due to high wind gusts it was not possible for Goodwill to safely berth in Guernsey earlier this morning. She has proceeded to Jersey and will return to Guernsey if conditions permit, 8 hours behind schedule. This will delay deliveries that were due to be made in Guernsey today. Wednesday 24 January 2018 - Commodore Goodwill. Channel Islands - UPDATE: the Goodwill has been repaired and departed at approx 10.30pm yesterday, arriving in Guernsey and Jersey this morning behind normal schedule. Unfortunately there will be some delays in deliveries this week whilst the backlog is cleared. Tuesday 23 January 2018 - Sailing Cancellations. Channel Islands - the Commodore Goodwill has technical issues with her Thermal Oil System, contractors are now onboard. Yesterday evening's departure was cancelled so there will be no arrivals at Jersey and Guernsey this morning. We are awaiting an update regarding repairs later today. UPDATE: the Goodwill has been repaired and departed approx 10.30pm. Isle of Man - Due to adverse weather unfortunately this evening's sailing to the Isle of Man has been cancelled. Tuesday 16 January 2018 - Sailing Cancellation. 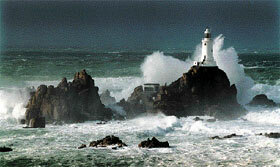 Jersey - Due to high wind speeds up to gale force 9 the Clipper evening arrival into Jersey has been cancelled. Tuesday 02 January 2018 - Happy New Year. December 2017 - Christmas 2017 Sailings. Christmas Schedule - The last trailers before Christmas leave on Tuesday 19th December so goods need to be in our Bradford depot by Monday 18th latest. Any collections after this date will be made in the New Year. Thursday 14 December 2017 - Sailing Cancellation. Guernsey - Due to high wind speeds the Clipper could not dock at Guernsey yesterday evening. Guernsey trailers will be unloaded in Jersey and shipped this morning by the Goodwill, ETA 0700 weather dependant. Unfortunately this will delay Guernsey deliveries over the next two days. Monday 11 December 2017 - Sailing Cancellation. Guernsey - Due to high wind speeds the Goodwill could not dock at Guernsey this morning. Guernsey trailers will return to Portsmouth and be shipped this evening. Unfortunately this will delay Guernsey deliveries over the next two days. Sunday 10 December 2017 - Sailing Cancellation. Channel Islands - Due to high wind speeds up to force 11 in the English Channel the Clipper sailing has been cancelled this morning. Additional cancelled sailings of the Clipper and Goodwill are to be expected. Monday 27 November 2017 - Sailing Cancellation. Channel Islands - Due to adverse weather the Goodwill will not be calling into Jersey today. Goods bound for Jersey will be offloaded in Guernsey for collection by the Clipper this evening. This disruption will have additional impact on current service levels. Your patience is appreciated whilst clearing the backlog of freight caused by the recent cancellations and current weather disruptions. Channel Islands - The Clipper was unable to dock at Jersey yesterday evening remaining alongside in Guernsey overnight. She is expected to dock at Jersey this morning at approx 8.00am and will then return to Portsmouth to operate the Goodwill’s scheduled departure this evening. Unfortunately there was no AM departure from Portsmouth this morning as The Goodwill is still under going repairs. Please note that there is severe disruption in both islands and service and delivery delays are expected to last throughout the week. Channel Islands - Condor have confirmed that there is more damage to the Goodwill than first anticipated. The sailing from Portsmouth this evening is cancelled. Additionally the forecast is 40-50 knot winds for the Channel Islands and the Clipper will unlikely to be able to dock at Jersey this evening. Please note these cancellations are causing considerable disruption so please expect delays with all deliveries over the next 48 hours. Tuesday 21 November 2017 - Sailing Cancellation. Channel Islands - The sailing from Portsmouth this evening is cancelled. The Goodwill suffered an engine turbo failure earlier today and is making its way back to Portsmouth for repairs. Friday 20 October 2017 - Sailing Cancellation. Channel Islands - Due to the latest weather forecasts and predicted wave heights in the Channel, Condor have also cancelled the Saturday sailing from Portsmouth. Unfortunately there will be some delays in deliveries next week whilst the backlog is cleared. Thursday 19 October 2017 - Sailing Cancellation. Channel Islands - Due to the latest weather forecasts and predicted wave heights in the Channel, Condor have cancelled the Friday evening sailing from Portsmouth. Tuesday 17 October 2017 - Sailing Delays. Channel Islands - Due to adverse weather in the Channel last night the MV Arrow was unable to dock in Jersey until earlier this morning. The forecast for the remainder of the week remains unsettled and further sailing disruption is likely. Monday 16 October 2017 - Cancelled Sailings. Isle of Man - Due to adverse weather it is necessary to cancel all IOM sailings on Monday and Tuesday. Unfortunately this will delay IOM deliveries this week whilst the backlog is cleared. Wednesday 13 September 2017 - Cancelled Sailing. Channel Islands - Due to adverse weather it was necessary to cancel the MV Arrow call into Jersey last night. We should have an update from Condor Ferries later today. Unfortunately this will delay Jersey deliveries this week whilst the backlog is cleared. Friday 08 September 2017 - Ferry Maintenance. Channel Islands - The Commodore Clipper and Commodore Goodwill both require maintenance in dry dock. The Clipper will be removed from service on 8th September and replaced by the MV Arrow. She is scheduled to return to service on Tuesday 10th October. There is a requirement to cancel the evening call into Guernsey every Wednesday. The Goodwill will be removed from service following the return of the Clipper and is scheduled to return on Thursday 2nd November. The cancellation of the Wednesday evening call into Guernsey will continue until the Goodwill returns in November. Wednesday 07 June 2017 - Sailing Delays. Channel Islands - Due to adverse weather conditions sailings are running behind schedule and deliveries are currently disrupted. Isle of Man - Following the cancelled sailing on Tuesday evening there is a backlog of goods. Unfortunately there will be some delays in deliveries this week whilst the backlog is cleared. Monday 16 May 2017 - Isle of Man TT. Isle of Man - 27 May to 9 June is the Isle of Man TT. This is an annual motorcycle event run on the Isle of Man and as there are road closures, delays to deliveries are to be expected. Tuesday 09 May 2017 - Liberation Day. Channel Islands - Tuesday 9 May is Liberation Day. This is a national holiday for Jersey and Guernsey and no deliveries will be made. There will be a knock-on effect especially following the Bank Holiday on the previous Monday, and some of the week's deliveries will be delayed. Wednesday 05 April 2017 - Ferry Repaired. Channel Islands - The Commodore Goodwill technical issues have been resolved and sailings have resumed. There will be disruptions to deliveries over the next couple of days as the backlog is cleared. Tuesday 04 April 2017 - Sailing Cancellations. Channel Islands - Unfortunately the Commodore Goodwill has an issue with its port main engine and was unable to depart from Portsmouth last night. Condor Ferries are currently assessing the situation and we are awaiting a further update later today. Deliveries this week are likely to be disrupted. Monday 13 February 2017 - Ferry Crash. Isle of Man - Unfortunately the 'Ben-my-Chree' has crashed into Douglas harbour. Sailings are cancelled until a full assessment can be made. The MV Arrow will be brought in as a replacement vessel this week to maintain service. Deliveries this week are likely to be disrupted. Thursday 12 January 2017 - Sailing Cancellations. Channel Islands - Due to adverse weather all sailings to the Channel Islands are cancelled Thursday and Friday. Unfortunately there will be some delays in deliveries next week whilst the backlog is cleared. Tuesday 03 January 2017 - Happy New Year. Monday 21 November 2016 - Sailing Cancellations. Isle of Man - Due to adverse weather the sailings to the Isle of Man are cancelled today. Thursday 17 November 2016 - Portsmouth Harbour. Channel Islands - Portsmouth harbour has now reopened following the controlled explosion of the bomb discovered earlier in the day. Sailings to the Channel Islands have now resumed. More information here - BBC News. Wednesday 16 November 2016 - Portsmouth Harbour. Channel Islands - The Commodore Clipper sailing is cancelled today following the discovery of an unexploded WWII bomb in Portsmouth harbour. It will be removed today by the Royal Navy, more information here - ITV News. Monday 1 August 2016 - Battle of Flowers. Jersey - Thursday 11th and Friday 12th August is Battle of Flowers. This is an annual carnival in Jersey. There will be road closures and some of the week's deliveries will be delayed. Wednesday 15 June 2016 - Ferry Maintenance. Channel Islands - The Commodore Goodwill will be out of service on Sunday 19th June for two weeks whilst maintenance is being carried out. The MV Arrow will operate as a replacement vessel, however due to the lower trailer capacity and sailing profile there will be disruption to deliveries. During this period there will be no Wednesday evening arrivals in Guernsey. We will keep you informed of specific disruptions as they occur. Monday 9 May 2016 - Liberation Day. Channel Islands - Monday 9 May is Liberation Day. Wednesday 20 April 2016 - Power Cut - now fixed. Bradford Office - (now fixed) we are currently experiencing a power cut which may last all day. Please note we will only have one incoming phone line - so could we please ask for you to contact us via email. Thursday 03 March 2016 - Sailing Delays. Channel Islands - the Goodwill arrived in Jersey over 2 hours late this morning. Unfortunately, due to high seas, a truck (not ours) has toppled on its side onboard and is blocking the unloading of trailers. This will result in delays to Jersey deliveries today. Thursday 11 February 2016 - Sailing Delays. Channel Islands - the Goodwill arrived in Jersey first this morning however she was 3 hours behind schedule and is now 9 hours behind schedule for Guernsey. This will result in delays to Channel Island deliveries today. Monday 08 February 2016 - Sailing Cancellations. Channel Islands - Due to adverse weather all sailings to the Channel Islands are cancelled. High wind speed is forecast for Tuesday and further cancellations are expected. Friday 01 January 2016 - Happy New Year. Thursday 03 December 2015 - Delivery Disruptions. Channel Islands - Sailings have been behind schedule this week and due to the previous weather related cancelled sailings there is a backlog of goods. Unfortunately there will be some delays in deliveries this week whilst the backlog is cleared. Monday 30 November 2015 - Sailing Cancellations. Channel Islands - Adverse weather has caused all sailings to be cancelled over the weekend and today. The MV Arrow will hopefully sail tomorrow, weather permitting. Unfortunately there will be delays in deliveries this week whilst the backlog is cleared. Thursday 19 November 2015 - Delivery Disruptions. Channel Islands - Due to adverse weather conditions the Goodwill is running behind schedule and deliveries will be disrupted. Jersey - arrived in Jersey first but over 3 hours behind schedule. Guernsey - expected at approximately 11.00am. Unfortunately this will delay deliveries that were due to be made today. There will be further disruption this week due to high wind speeds forecast. Monday 16 November 2015 - Sailing Cancellation. Channel Islands - Due to high wind speeds forecast tomorrow the MV Arrow morning sailing to Jersey and Guernsey is cancelled. There will be a knock-on effect and some of this week's deliveries will be delayed. Monday 09 November 2015 - Ferry Maintenance. Channel Islands - The Goodwill is now back in service ahead of schedule. However the Clipper has returned to dry dock for further maintenance and is now expected to be back in service on Monday 14th December. The MV Arrow will remain as a replacement vessel and during this period there will be no Wednesday PM arrivals in Guernsey. Tuesday 06 October 2015 - Sailing Cancellation. Channel Islands - Due to high wind speeds this evening and tomorrow morning the MV Arrow sailing to Jersey has been cancelled today. Freight destined for Jersey will be dropped at Guernsey for collection by the Goodwill tomorrow morning. 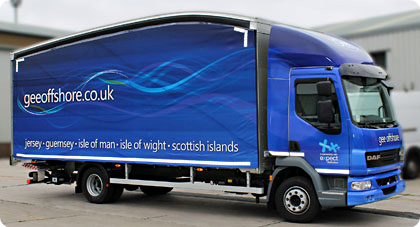 Monday 21 September 2015 - New Curtainsider. Bradford Depot - We have added a new DAF LF 12 tonne curtainsider for local collections. It features a fuel saving aero cab and lightweight teardrop body, and for safety a 360 degree camera system and high level lights. With new full colour livery running from the cab through the curtains and onto the rear - this is sure to stand out. Monday 14 September 2015 - Sailing Cancellation. Channel Islands - Due to high wind speeds this evening the MV Arrow sailing to Jersey is cancelled. Freight destined for Jersey will be dropped at Guernsey for collection by the Goodwill tomorrow morning. Clipper - 13th September to 16th October. Goodwill - 16th October to 18th November. The MV Arrow will operate as a replacement vessel, however due to the lower trailer capacity and sailing profile there will be disruption to deliveries. During this period there will be no Wednesday PM arrivals in Guernsey. We will keep you informed of specific disruptions as they occur. Wednesday 06 August 2015 - Telephone line fault. The issue with the phone lines has now been resolved. Please note that ringing the temporary number may result in your call not being answered. We apologise for any inconvience this may have caused. Tuesday 05 August 2015 - Telephone line fault. There is a problem that is affecting 01274 484848. Can you please ring 01274 838320 until the fault is resolved. We apologise for any inconvience this may have caused. Monday 23 February 2015 - Sailing Cancellation. Channel Islands - Due to weather conditions which are forecast for tomorrow the Jersey sailing is cancelled. Unfortunately this will delay deliveries that were due to be made in Jersey this week. Guernsey shipments are not affected. Wednesday 14 January 2015 - Delivery Delays. Channel Islands - The Commodore Goodwill is behind schedule and will arrive in Jersey today at 1.00pm instead of 6.00am. Unfortunately this will cause delays to all consignments today and most deliveries will be now made tomorrow. Please note that tonight's sailing is still cancelled. Isle of Man - Due to severe weather conditions sailings to the Isle of Man have been cancelled today. Tuesday 13 January 2015 - Sailing Cancellation. Channel Islands - Due to severe weather conditions which are forecast for Wednesday and Thursday both the Commodore Clipper and Commodore Goodwill sailings are cancelled on Wednesday. Thursday 08 January 2015 - Sailing Disruption. Channel Islands - Due to high winds in the English Channel ferry sailings are currently delayed and later sailings may also be cancelled. Thursday 01 January 2015 - Happy New Year. Friday 19 December 2014 - Sailing Disruption. Channel Islands - The Commodore Goodwill sailing has been cancelled - she is still enroute to Portsmouth due to yesterday's delays. The sailing is now rescheduled for Saturday. Thursday 18 December 2014 - Christmas 2014 Sailings. Christmas Schedule - The last trailers before Christmas leave early Friday 19th December. Any collections after this date will be made in the New Year. Channel Islands - The Commodore Goodwill is running approximately 10 hours behind schedule following yesterday's delays. This will have a knock-on effect and cause further delays with our Thursday/Friday shipments. Goods that were due to be delivered on Friday will be delivered on Monday. Wednesday 17 December 2014 - Sailing Disruption. Jersey - The Commodore Goodwill is still at Guernsey and is now scheduled to arrive at Jersey 9 hours late at 3.00pm. Unfortunately Jersey deliveries that would have been made today will be delayed until tomorrow. Wednesday 17 December 2014 - email problems. Our email is now working. Please note if you send us an email and we don't respond promptly then chances are we didn't receive it. If we don't get back to you could you please ring the office on 01274 48 48 48. Monday 15 December 2014 - email problems. We are currently experiencing problems with our email. If we haven't responded to any mail you may have sent could you please ring the office on 01274 48 48 48. Monday 15 December 2014 - Delivery Disruptions. Channel Islands - One of the Commodore Clipper's rudders was damaged over the weekend and sailings were cancelled. Due to the previous weather related cancelled sailings there is now a backlog of goods for the Channel Islands. Unfortunately there will be some delays in deliveries this week whilst the backlog is cleared. Wednesday 10 December 2014 - Sailing Disruptions. All Destinations - Due to adverse weather conditions sailings to most islands will be disrupted. Channel Islands - delayed sailings Wednesday and Thursday. Isle of Man - sailings cancelled Wednesday and Thursday. Scottish Islands - sailings to all islands cancelled. Thursday 27 November 2014 - Sailing Disruption. Channel Islands - Due to high winds forecast for St. Peter Port, the Commodore Goodwill will not be able to arrive in Guernsey on Friday morning. Unfortunately this will delay deliveries that were due to be made in Guernsey on Friday. Monday 01 September 2014 - Clipper update. Channel Islands - The Clipper is now back in service and the backlog cleared. Deliveries to the Channel Islands are now fully operational. Monday 04 August 2014 - Clipper update. Channel Islands - Due to the lower trailer capacity of the replacement vessel servicing the Channel Islands there is still major distruption to food supplies and general freight. Condor Ferries have chartered a second ro-ro cargo ship 'MV Arrow' to work alongside the 'MN Toucan'. This will help reduce the backlog of goods at Portsmouth and backlog of empty trailers in the Islands. Shipping service levels may return to normal by the end of this week, however there will be delays in Island deliveries due to the overwhelming amount of freight. Thursday 24 July 2014 - Clipper update. Channel Islands - Condor Ferries have today confirmed that they have secured the charter ro-ro cargo ship ‘MN Toucan’. This is due to be in service on Tuesday 29 July and will begin by collecting empty trailers in Guernsey before returning to Portsmouth that evening to collect full trailers for the Islands. We are expecting service levels to return to normal by the end of next week. Channel Islands - The Commodore Clipper repairs will be 'more complex' than first anticipated and she will be out of service for the next 5 weeks. Condor Ferries are attempting to find a suitable stand-in ferry however there is no news at present. Please be aware that this will cause major problems with deliveries to the Channel Islands. Please contact us for further information. Friday 18 July 2014 - Clipper update. Channel Islands - Condor Ferries have confirmed that all Commodore Clipper sailings are cancelled until 27 July. Please be aware that this will cause delays to all Channel Island shipments over the next few weeks. Essential, perishable and medical goods will take priority and all other goods will be shipped when space is available. Expect shipments to take in excess of one week. Tuesday 15 July 2014 - Clipper Out of Action. Channel Islands - The Commodore Clipper ferry struck the seabed off Guernsey on Monday and is now being transported to Falmouth to undergo repair in dry dock. Condor Ferries expect the service to be suspended until at least July 26th. We expect deliveries will be disrupted over the next few weeks. Friday 9 May 2014 - Liberation Day. Channel Islands - Friday 9 May is Liberation Day. This is a national holiday for Jersey and Guernsey and no deliveries will be made. There will be a knock-on effect especially following the Bank Holiday on Monday, and some of this week's	deliveries will be delayed. Thursday 27 March 2014 - email problems. Office - email issues are ongoing - please contact us on 01274 484848. Wednesday 26 March 2014 - email problems. Office - we are currently experiencing issues with email, both sending and receiving. If you have sent us an email and we have not replied can you please contact us on 01274 484848. Hopefully the mail service will be restored today. Apologies for any inconvenience caused. Friday 14 March 2014 - Sailing Disruption. Channel Islands - the Goodwill is unable to dock in Jersey due to severe fog. She is now heading for Guernsey at due to arrive late morning. Unfortunately this will cause delays to all non-perishable consignments on Guernsey and and we are awaiting news on the Jersey sailing. Isle of Man - sailings have been delayed due to fog and goods scheduled for delivery on the island today are still en-route. Thursday 13 February 2014 - Sailing Disruption. Channel Islands - there is a severe weather warning forecast for tomorrow. The Clipper will be cancelled on Friday 14th February due to the extreme wind speeds expected. At this time we have no information on the Commodore Goodwill and will update as soon as we know. Thursday 06 February 2014 - Sailing Cancellations. Channel Islands - the Channel Islands is currently experiencing extreme weather with a worsening forecast for tomorrow and the weekend. Unfortunately sailings will be cancelled and the backlog will run into next week. We will endeavour to deliver goods as soon as possible, however food and perishables take priority. Wednesday 05 February 2014 - Sailing Cancellation. Channel Islands - Due to adverse weather the Commodore Clipper will be unable to berth at Jersey today. Jersey Goods will be offloaded in Guernsey for onward shipping to Jersey at a later date. Isle of Man - Due to adverse weather yesterday's evening sailing was cancelled. Tuesday 04 February 2014 - Sailing Disruption. Channel Islands - Sailings this week will be disrupted due to adverse weather - 8.0m swells and windspeeds of 60+ knots. Cancelled sailings of the Clipper and Goodwill are to be expected. Tuesday 07 January 2014 - Sailing Disruption. Channel Islands - The Goodwill was unable to dock in Jersey due to adverse weather damaging the berth. Repairs are being made and the berth should reopen tomorrow. Unfortunately there will be some delays in deliveries this week whilst the backlog is cleared. Wednesday 01 January 2014 - Happy New Year. Thursday 12 December 2013 - Christmas 2013 Sailings. Christmas Schedule - The last trailers before Christmas leave on Tuesday 17th December. Any collections after this date will be made in the New Year. Office opening times - Closed Tuesday 24th December 2013 - Reopening Thursday 2nd January 2014. Friday 22 November 2013 - Delivery Disruption. Channel Islands - Due to yesterday's sailing disruption the Goodwill will arrive in Jersey at approx 11.00am and in Guernsey at approx 3.00pm today. Unfortunately this will cause delays to all non-perishable consignments on Jersey and no deliveries will be made in Guernsey. Thursday 21 November 2013 - Sailing Disruption. Channel Islands - The Goodwill was unable to dock in Guernsey due to adverse weather and was re-routed to Jersey. The Goodwill eventually docked in Guernsey approx 12 hours late. All scheduled deliveries in Guernsey will be made on Friday. Sunday 27 October 2013 - Sailing Disruption. Channel Islands - Adverse weather has caused all freight sailings to be cancelled Sunday and Monday. The Clipper has been rescheduled to sail from Portsmouth at 09.00 Tuesday, weather permitting. Unfortunately there will be some delays in deliveries this week whilst the backlog is cleared. Wednesday 04 September 2013 - Sailing Disruption. Update - The Arrow has been unable to dock in Guernsey today due to persistant fog. Unfortunately tomorrow's sailing has been rescheduled to arrive at 16.00, therefore we will be unable to make any Guernsey deliveries. Channel Islands - The replacement vessel 'Arrow' was unable to dock in Guernsey this morning due to fog. The Arrow sailed onward to Jersey and docked approx 8.00am. It will proceed to Guernsey later today. Tuesday 20 August 2013 - Heulin Renouf Shipping. Channel Islands - Unfortunately Heulin Renouf Shipping has stopped trading after 80 years of servicing the Channel Islands. Huelin Renouf carried containerised and large cargo as Lo-Lo. We ship as Ro-Ro and our service to the Channel Islands is not affected. However there may be some delays in September due to the additional capacity placed on the Ro-Ro service. Monday 12 August 2013 - Sailings Rescheduled. Channel Islands - Condor Ferries have announced that their freight vessels will be withdrawn from service in September for essential maintenance. The Goodwill will be withdrawn from 1st to 8th September 2013. The Clipper will be withdrawn from 8th to 26th September 2013. They will be replaced by a freight only Ro-Ro vessel which has reduced capacity and may run a little slower than the normal scheduled sailings. As a result there could be potential disruption and delays to our service over the month of September. We will endeavour to keep all customers updated. Tuesday 07 May 2013 - Liberation Day. Channel Islands - Thursday 9 May is Liberation Day. Tuesday 07 May 2013 - Update. Isle of Man - The 'Ben My Chree' has been repaired and is now back on schedule. Thursday 02 May 2013 - Urgent. Isle of Man - The 'Ben My Chree' has collided with the quayside in the Isle of Man causing damage to the dock and the vessel. It is currently making its way back to Heysham for damage assessment. Unfortunately delays to the Isle of Man service are to be expected. We will update the details as they are announced. Monday 18 March 2013 - Update. Channel Islands - the conditions have now cleared in Jersey and Guernsey. Outstanding deliveries will be cleared by tomorrow, after which our service level will return to normal. Wednesday 13 March 2013 - Snow - Delays. Channel Islands - the Goodwill docked in Jersey this morning and is due in Guernsey at 11.00am - 3 hours behind schedule. Conditions are improving in the Channel Islands and deliveries will be made where possible however many outlining areas are still badly affected. Unfortunately there will be delays in deliveries whilst the backlog is cleared. Tuesday 12 March 2013 - Snow - Major Delays. Channel Islands - snow is causing major disruption to all Channel Island shipments. There will be no island deliveries today due to heavy snow and ice. Monday's ferry sailings were cancelled and there is only one sailing today due to arrive in Jersey this evening at 6.30pm. Monday 11 March 2013 - Weather Warning. Channel Islands - forecasters have issued a severe weather warning for the Channel Islands. Snow and severe gale-force winds are expected to lead to blizzard conditions. Wednesday 06 February 2013 - Delays. 10.00am - the Commodore Goodwill has docked at Jersey, however Jersey deliveries may be delayed. Guernsey trailers are shipping from Jersey to Guernsey later today for delivery tomorrow. 7.00am - the Commodore Goodwill has been unable to dock at Guernsey due to adverse weather conditions. Now proceeding to Jersey where the conditions will be assessed for berthing. Currently no trailers have been offloaded in either Jersey or Guernsey so please expect delays on deliveries. Saturday 5 January 2013 - Delays. Channel Islands - the Commodore Goodwill is now back in service, however there will be some delays in deliveries whilst the backlog is cleared. Wednesday 2 January 2013 - Delays. Channel Islands - the Commodore Goodwill is currently still being serviced following maintenance over the Christmas break. Unfortunately this will delay certain deliveries this week. It is due to be back in service on Friday 4 January. Tuesday 1 January 2013 - Happy New Year. Friday 5 October 2012 - Condor Logistics to close. Condor Group has announced that it is planning to close the Logistics division which employs around 50 people in Jersey, 20 people in Guernsey and 110 people in the UK. Tuesday 8 May 2012 - Delivery delays. This is a national holiday for Jersey and Guernsey and no deliveries will be made. There will be a knock-on effect especially following the Bank Holiday on Monday, and this week's	deliveries will be delayed. Saturday 28 April 2012 - Commodore Clipper. Channel Islands - the Commodore Clipper is now back in service. Friday 27 April 2012 - Commodore Clipper. Channel Islands - the Commodore Clipper is currently being assessed following the onboard fire yesterday - we are awaiting news of when it will be back in service. The Commodore Goodwill has sailed with the Clipper's perishable goods. Unfortunately, most of the goods that should have shipped yesterday will not ship until this evening. Thursday 26 April 2012 - Delays. Channel Islands - 13.00 - the Commodore Clipper has had a fire onboard on the way to the islands and has turned back. It is currently making its way back to Portsmouth. Unfortunately, deliveries that were due to be made tomorrow will be delayed. Future sailings will undoubtedly be affected. Channel Islands - 09.00 - the Commodore Goodwill has been delayed due to bad weather and has arrived 2 hours late. Unfortunately this will delay certain deliveries that were due to be made today. Tuesday 28 February 2012 - Delays. Channel Islands - the Commodore Goodwill engine has now been fixed and is currently running on time. Deliveries are back to normal. Friday 24 February 2012 - Delays. Channel Islands - the Commodore Goodwill has engine problems as is currently making its way to Jersey, eta 10.00am. The onward shipping to Guernsey is expected to arrive at 2.00pm this afternoon. Unfortunately this will delay deliveries that were due to be made today. Friday 17 February 2012 - Telephone line fault. The fault on the line has now been resolved. Thursday 16 February 2012 - Telephone line fault. Friday 06 January 2012 - Ferries running again. Channel Islands - the Commodore Clipper docked yesterday after spending 25 hours at sea! Both ferries have sailed from Portsmouth this morning to help clear the backlog due to the adverse weather and loss of sailings this week. Thursday 05 January 2012 - Adverse weather disrupts most sailings today. Channel Islands - the Commodore Clipper that sailed yesterday morning is sheltering outside the port of Guernsey whilst the Goodwill has sailed directly to Jersey and is waiting for the weather to abate before docking. Isle of Man - the Heysham to Douglas sailing is delayed due to adverse weather. Friday 16 December 2011 - Adverse weather disrupts most sailings. Channel Islands - The Goodwill which was due to return to Portsmouth this afternoon has been further delayed in Jersey. Sailings will be disrupted over the coming weekend with a knock-on effect to deliveries next week.